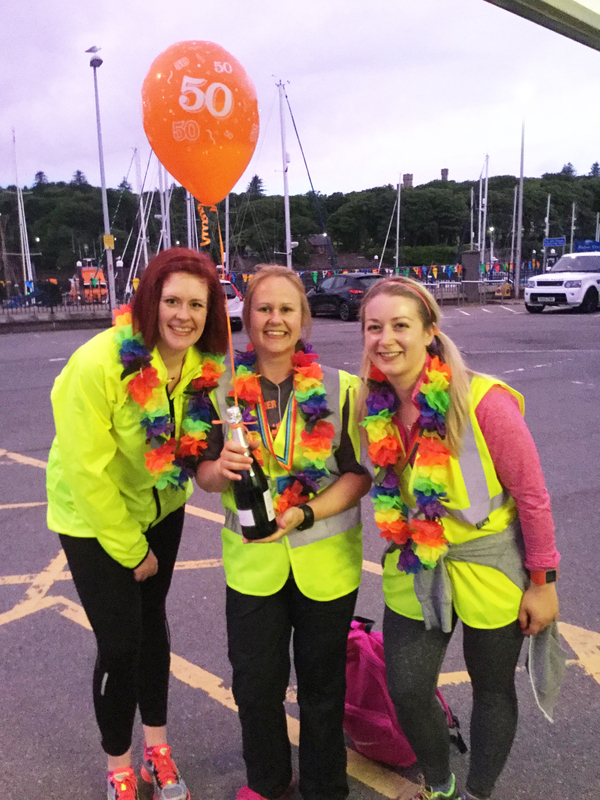 A team of hardy walkers trekked from “Dusk2Dawn” on Lewis last weekend to complete an epic 50-kilometre challenge in aid of the Leanne Fund. Sixty walkers left Perceval Square at 8pm on Friday, taking in trails around Lews Castle prior to walking a loop of Newvalley, Benside and Bakers Road then out to Point where they took in Bayble and Knock before returning to Stornoway. First across the line in an amazing time of eight hours and 19 minutes were Sara Anne MacQueen, Kirsteen Stewart and Marina Gomez (pictured). The event raised more than £4,000 to support those with cystic fibrosis across the Highlands and Islands and in Grampian. Chrisetta Mitchell from the organising team said: “This year’s event was a great success and we are very grateful to all those who took part and supported the Leanne Fund. Every penny raised through entry fees and sponsorship goes towards supporting those with cystic fibrosis and really does make a difference to their lives and their families. “We are also indebted to the volunteers who assisted throughout the night and also to local businesses for their generosity in supporting the event. A massive thank you to Tesco Stornoway for generously donating all the bananas and Mars bars for our event. Thanks also to Duncan Mackay & Sons for loan of traffic cones to help keep our walkers safe and thanks to Stornoway police for their support with traffic management.